THIS unusual, distinctive, rich and creamy soup is inspired by the exotic surroundings of the South Pacific. The ingredients and method are pretty straightforward, however, making this dish accessible to everyone – wherever they live! Place the heads and carcasses in a large pan with about 1.5 litres of water, the salt, onion, black pepper and chilli and bring to a simmer. Simmer for 20 minutes, skimming if necessary. Strain this mixture into another large saucepan and adjust the seasoning if required. Stir in the coconut milk, lemon juice, and the fish cubes and reheat over a low heat for about 5 minutes, until the fish is tender and cooked through. Do not overboil. Ladle the soup into bowls and serve with chilli shavings. Da Kana, as they say in Fiji! Enjoy your meal! Medical device sales reps a law unto themselves? WHY are medical technology sales representatives apparently exempt from providing proof of competency to the hospitals they access in the course of their work in the United Kingdom? The employee’s knowledge and competencies in respect of the clinical environment they enter are not set, measured and validated by an independent agency. This would appear to be an abdication of the National Health Service responsibility to its staff and patients, and it is at odds with the procedures and practices of other government bodies. The National Health Service in the UK has in this last three years been rocked by increasingly worrying revelations and scandals. There are almost daily reports of gagging orders on staff to prevent the reporting of patient neglect or incidents of medical negligence. The minister of health has said that standards within the NHS are not acceptable. Newspapers carry front-page headlines proclaiming that four out of 10 hospitals are unsafe. The Jimmy Savile debacle points to a lack of regulation in respect of non-clinical personnel having access to hospitals and clinical environments. So who is running the show and, more importantly, who is responsible and accountable? Years ago, the likes of Sir Lancelot Spratt was responsible for the clinicians, and a formidable Matron was responsible for the non-clinical staff and oversaw everything else in the hospital from food to bed pans. Sir Lancelot and the Matron are gone and have been replaced by an army of fresh-faced management graduates who now run the hospital. However, and in spite of the efforts of this army of usually non-clinically trained managers, standards continue to fall. Doctors, nurses and medical staff who are required to have a therapeutic contact with patients are trained to clearly defined national standards and are governed by colleges and associations who set competencies and maintain standards. All clinical staff have to demonstrate by examination set by an independent body that they have achieved the required standard. In most cases they are required to maintain and update their skill set by acquiring continuing medical education (CME) points awarded after further training. Technical and maintenance staff who are directly employed by the hospital are vetted by the hospital as part of their employer’s liability. Laboratory and scientific staff will have proven qualifications from a university or other independent awarding body. Directly employed maintenance staff, such as plumbers and electricians, have to show and maintain current Joint Industry Board (JIB) or Gas Safe registration to be employed. Then there are the people who enter the hospital as part of their work who are not employed by the hospital. In the case of building and technical maintenance workers, their presence is granted by short-term contracts – one for the company and one for the individual employee. However, there is a group of people who access the hospital for work who appear to be exempt from providing proof of competency. These are the sales representatives who work for medical technology companies. They are the people who sell implants and technology to clinicians and provide technical support for the use of their products. They may be required to be present in a clinical setting while patient-therapeutic or surgical procedures are being performed. Furthermore , they may be asked to answer questions and solve problems arising during the patient use of their products. The companies employing these representatives will say that their employees are adequately trained and have the knowledge and skills necessary to support the use of their products. That may be true, and all responsible companies will ensure that their staff are trained and understand the technical aspects and indications for use of their products in a clinical setting. That may suffice for their products. However, people entering a clinical environment must also understand all of the responsibilities expected of them by the hospital and the patient, or patients, undergoing treatment. Where the company’s assurances fall down is that the employee’s knowledge and competencies in respect of the clinical environment are not set, measured and validated by an independent agency. So self-regulation is no regulation. There are a number of examples for which training content and methodology is validated and training outcomes are measured by an independent agency. Learning to drive is a good example. To be registered as an Approved Driving Instructor (ADI) and to teach people to drive, it is necessary to complete a training course and pass an examination set by the Driving Standards Agency (DSA). United Kingdom law requires driving instructors to be qualified before they can charge for their services. The licence to drive a car is issued by another government agency – the Driver and Vehicle Licensing Agency (DVLA) – upon successful completion of a theory and practical driving test. In this case, the person providing the training cannot set the required standard to be achieved to pass the test, nor can they issue a licence to drive. The setting of standards and the assessment of outcomes of training by independent agencies protects trainers from accusations of inadequate standards and bias and guarantees that those trained are fit for purpose. There are medical technology company trade associations who use third parties to register employees as having achieved the requisite standard to enter a clinical environment. The question arising is: who sets the standard and how is it measured? There is legislation which specifies the competencies and legal requirements for hospital access. It is therefore not within the gift of trade associations or any other agency with a commercial interest in accessing hospitals to set, measure and administer standards. The safety of the patient, the company employees and the clinical staff is the responsibility of the hospital. It is they who should set the standards. The medical device company’s responsibility is to achieve the standard and have it independently validated. Within the last five years, credentialing companies have been set up to provide hospitals with a quick way of checking the criminal record status and competency of people seeking access to clinical areas. This may give a false sense of security, as the hospital staff rely on the credentialing company’s validation. So, unless the credentialing companies examine those they register, which they do not, whose and what validation are they relying on? Like the driving test, there must be a national standard for hospital access and a requirement that any training meets the standard and that the outcome is validated by an independent agency. The criteria and requirements for hospital access cannot be at the discretion of individual hospitals or of medical companies or associations. Failure to implement a standard is an abdication of the NHS responsibility to its staff and patients and is at odds with the procedures and practices of other government bodies. THE Chief Executive Officer of The Big Issue Foundation, Stephen Robertson, gave an exclusive live interview by phone on April 29, 2014, to The Talk To Phil & Dave Show, which is hosted by Phyllis Joyce and by me on Pulse 98.4 radio. Listen below to what he had to say about a raft of social issues affecting the lives of many in the United Kingdom today. The The Talk To Phil & Dave Show airs live every Tuesday from 2-4pm on Pulse 98.4, which broadcasts on FM across the city of Glasgow and outlying areas and across the world on the internet via various browsers and apps, including Tunein. You can read more about it in a PRWeb media release here. FORMER River City star Libby McArthur talked about her latest project on Scotland’s premier community radio chat show the Talk To Phil & Dave Show on Aug 12, 2014. Libby, best known as Oyster Cafe owner Gina Rossi in BBC’s Scottish soap River City, is also a producer, writer, director, singer, storyteller, inspirational speaker and political activist. She chatted live in the studio to my co-host Phyllis Joyce and me about the play 3,000 Trees, written by George Gunn, which she directs and which runs at the Edinburgh Festival Fringe run until August 24 at the Gryphon venue. 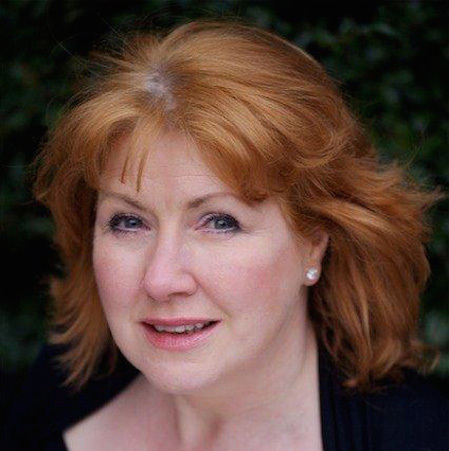 FORMER soap star Libby McArthur will be talking about her latest project on Scotland’s premier community radio chat show, the Talk To Phil & Dave Show, tomorrow (Aug 12, 2014). Libby, best known as Oyster Cafe owner Gina Rossi in BBC’s River City, is also a producer, writer, director, singer, storyteller, inspirational speaker and political activist. She will chat live in the studio to hosts Phyllis Joyce and David Boyes about the play 3,000 Trees, written by George Gunn, which she directs and which runs at the Edinburgh Festival Fringe run until August 24 at the Gryphon venue. Libby, who was born into a working-class family on the south side of Glasgow and embraced the principle of “service to others’ at an early age, has also appeared in Taggart, Looking After Jo Jo, Doctor Finlay, Take The High Road and Rab C. Nesbitt. When she was just 14, she had her own drama group in the city’s Gorbals area. By 21, she was a Drama Supervisor with the Youth Training Scheme (YTS), taking several groups of young people from writing and performing into full-paid work. And during Glasgow’s City of Culture celebrations in 1990, she became Drama Worker in Residence in Blackhill. A true lover of her country and her home city, she believes in the restorative powers of creative storytelling. 3,000 Trees concerns the death of Glasgow lawyer Willie MacRae – a former vice-president of the Scottish National Party and a controversial anti-nuclear campaigner – who was found dead at the wheel of his car in Sutherland. At first, it appeared he had veered off the road and crashed in a burn but the later discovery of a gun and a bullet wound to his head led police to conclude he had killed himself. However, it had been fired twice and conspiracy theories were fuelled when it emerged the book MacRae was writing, and his briefcase containing key documents, were missing. Neither MacRae’s medical reports nor the post-mortem data have ever been revealed. Nor has there ever been a fatal accident inquiry. MacRae was also the author of the maritime law of Israel and emeritus professor at the University of Haifa. After his death a forest of 3,000 trees was planted in Israel in his memory, hence the name of the play. Phyllis said: “Libby is a true Scottish talent – and someone who has something to say about a host of topics. She has become a household name in the land but she remains true to her roots and her working-class upbringing. The two-hour Talk To Phil & Dave Show airs live every Tuesday at 2pm and addresses serious issues affecting the lives of ordinary people in an unchallenging, down-to-earth setting while at the same time delivering a light-hearted entertainment package. Hosted by body-centred therapist and counsellor Phyllis Joyce and journalist and media consultant David Boyes, the programme first hit the airwaves in November 2013, with the aim of turning the spotlight every week on new topics of interest to listeners. It is augmented by the TalkToPhilNow website, which acts as a gateway to the show and which hosts helpful information in a number of media formats. Pulse, which transmits on the 98.4 FM frequency, is a community radio station based in Barrhead, near Glasgow, UK, broadcasting to all of South Glasgow, the city centre, East Renfrewshire, Paisley, Renfrewshire and Clydebank and online. 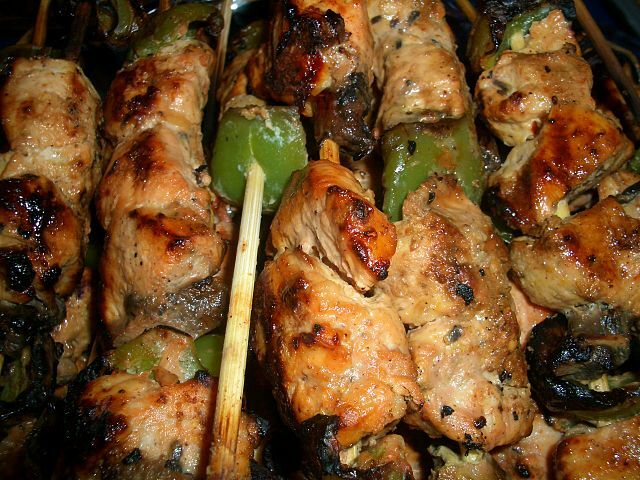 CHICKEN shish taouk is one of the tastiest chicken kebab-type recipes you’ll find. The name has Turkish origins but it is a common dish in virtually every Middle Eastern country, particularly Lebanon. It is usually ordered as a sandwich – rolled in a pita bread with Lebanese garlic sauce (their version of aioli) and some gherkins, fries and salad. Chicken shish taouk can also be served in a more refined manner on a plate with a side of rice and grilled vegetables. Mix all the ingredients together. 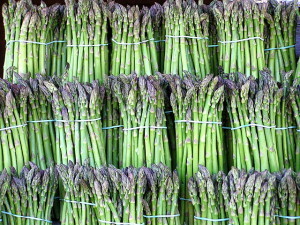 Place in a container, cover and allow to marinate in the fridge for at least four hours, or overnight if possible. Skewer the chicken just before grilling and put the skewers on a medium-hot griddle pan for 12 minutes maximum (until browned – not burned black – in places), turning occasionally. Remove them from the heat and, using a fork, strip the chicken from the skewers and immediately deposit them directly into a large, warm pot (Pyrex dish or other). Put on the lid tightly and allow to rest for 8-10 minutes – this helps the chicken become more moist (this step is optional). Take the grilled chicken shish tawook and spread equally across bread wraps or inside heated pitas. You can add gherkins (pickles), grilled tomatoes or grilled peppers. Roll up, as in a burrito, and enjoy. Eat as is (like a sandwich), or serve with rice and Greek-style salad (tomatoes, feta cheese, lettuce leaves, cucumber, olive oil and chopped fresh mint). You can also toast the sandwich in a panini grill for 2-3 minutes. “Bil-hanā’ wa ash-shifā’” – Enjoy your meal! THIS chicken Milanese is ridiculously easy to make – plus it’s packed full of flavour and goodness. All the way from northern Italy, this recipe turns a bland batch of chicken into a zinging, filling, moreish accompaniment to a salad, pasta or a medley of vegetables. I like to call these chicken nuggets for adults, through children will love them too. This recipe is enough for four people. Lay each piece chicken on a chopping board and slice the chicken through the middle (as though slicing open a bread roll) to create two thinner chicken breast shapes. Hit with a meat tenderiser to create an even thickness to the meat. Place the flour, salt and pepper in a wide, shallow oven dish or large plate. Beat the eggs in a second dish or plate. And in a third dish or plate, combine the breadcrumbs, tarragon, lemon rind and parmesan. Taking the chicken pieces one at a time, coat with flour, then dip into the beaten egg before dredging in the breadcrumb mixture. Place each piece of breaded chicken on a leaf of tinfoil about the size of a dinner plate. Take another piece of foil, place on top and add your next bath of chicken, so each level is one layer of meat thick. Press down with your hands and place the foil packet in the fridge for an hour or two. Place the oil in a hot frying pan (not too hot, because you don’t want the breadcrumbs to burn). Remove the meat from the fridge and gently fry two or three at a time, turning once or twice to ensure even browning on both sides. Cook for approximately 4 minutes. Place the now-golden chicken portions in a baking tray and place in an oven at 180C (350F) to keep warm. 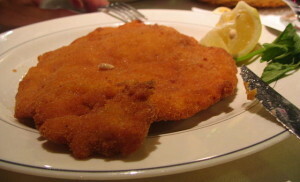 Now prepare your pasta, salad, vegetables or whatever you have decided is going to accompany your chicken Milanese. Serve the chicken Milanese with lemon wedges on the side. Buon appetito! 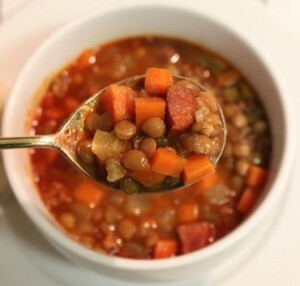 CHORIZO soup – you don’t have to be a brainbox to know that this recipe has its origins in Spain, so if you need a little bit of culinary sunshine on your dinner table this is the is the perfect recipe. There is enough of this hearty, spicy, vibrant soup to feed six. 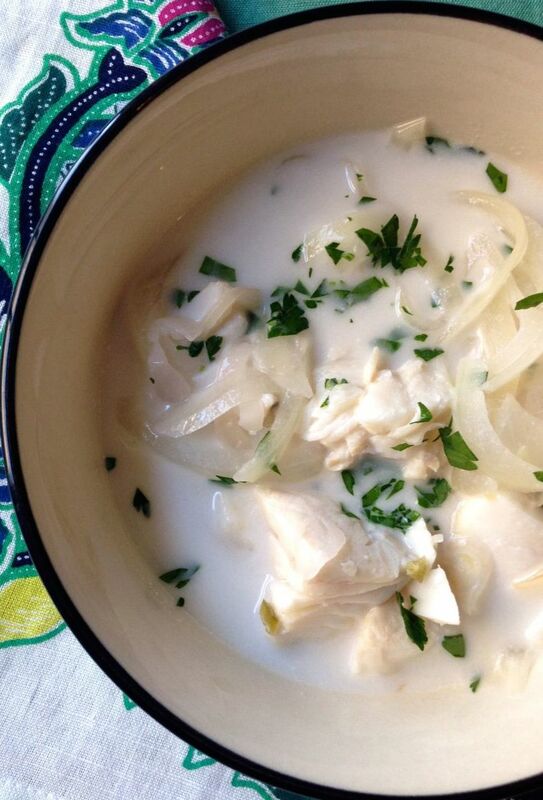 Serve with hunks of chunky bread. In a pot, heat the oil and lightly fry the carrot, onion and garlic. Add the cumin and parka. Then add the barley, tomatoes and stock. Season with salt and pepper before adding the chorizo. Allow to simmer for 45 minutes – until the barley is soft but retains a bite. If it’s still too firm, simmer for another 5 minutes. Now drain the lentils and pour them in. Simmer for another 5 minutes. Serve in deep plates or bowls with a sprinkling of parsley on top. ¡Buen apetito!, as they say in Spain! 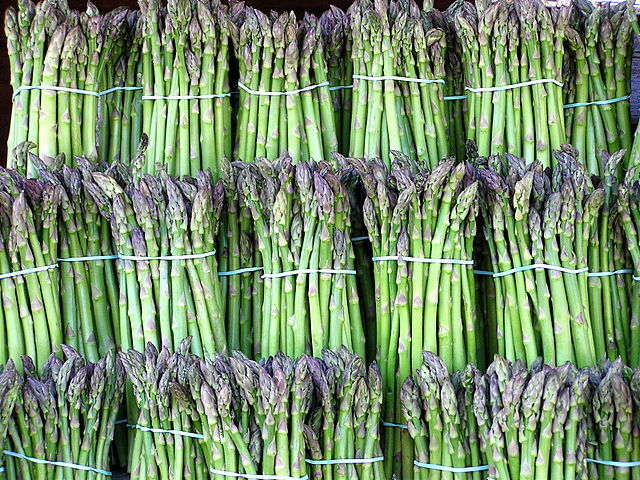 SUMMER is synonymous with asparagus, as it has such a short growing season around about the month of June in the UK. But supermarkets have asparagus available all year round, so this roasted asparagus on garlic bread with feta is perfect for a light summer lunch – whatever the month! The ingredients below should be enough for three or four people. Pile on top of the bread and serve. Enoy!